jagafeh invited me to play test a new card game he is working on. That was the first play test so it is early days yet and still needs some work, but I did enjoy it and I hope to see it come to fruition as a fully-fledged game. I will let you guys know when you can get it in the shops. Won't be for a while yet. The point of the game is to run a blog and accumulate followers. It reminded me guiltily of how remiss I have been in updating this blog. If it is of any consolation to you remaining LJers, FaceBook hardly fares better (although they did get a Christmas Rat photo which I confess it didn't occur to me to share on LJ--LJers still celebrate Christmas too, right? ), but Twitter, which I once despised, gets the bulk of my attention. Twitter however is at best a micro-blogging site, badly unsuited to this sort of long(ish) post where once can take some time out for quiet introspection. (I am in fact in need of some quiet introspection, for reasons I will not at this time go into here or elsewhere. I will blog about it when the time is right, if it ever is.) I've been away from LJ for so long that they have changed the user interface on me. It will take me a bit of time to get used to the changes, but I think it is heading in the right direction (though I note with dismay that it still can't suggest an LJ friend when I tag them). It still needs work to be as slick and interactive as FaceBook, but I still consider LJ "home" when it comes to blogging. Somehow FaceBook does not lend itself to thoughtful (I hope) posts like this one. I will however cross-post this to FB, so I look forward to being proven wrong. Anyway, I think this is enough metablogging for now, let us abandon navel-gazing and instead get to the meat: A very belated MFF report. This will basically be a (censored) transcription of a description of my MFF experience given to a fellow rat. I met colifox in fursuit and hung out with him a bit. Got to chat with tzup briefly. He said we should hang out but cons don't work out that way. He will be at MiDFur anyway. Then I went up to Kellogg's room and we had a nice talk and caught up since I hadn't seen him for five years. Rukario and I later went up to our room where we finally caught Spotti. We all went out and had dinner. Sadly he had a loud friend with him who really got on my nerves (conspiracy theorists tend to do that to me--call it a character flaw). A mouse I was really looking forward to seeing there was Dario Mouse. Unfortunately, I never got a chance to be photographed in fursuit with his fursuit, which is much the photo I would have preferred sharing with you, but this of me in my human suit with Dario will have to suffice. JBadger and I didn't get much quality time on Saturday as he was so busy. He did score me an invite to Tzup's birthday party but I ended up never attending. Sunday I realised I needs to be more focused with my time management. Spotti and I scrambled to go see the Pawpet show (as it was called, but not a patch on what the Europeans do). He empowered me to go out in my kigurumi, for which I'm grateful. 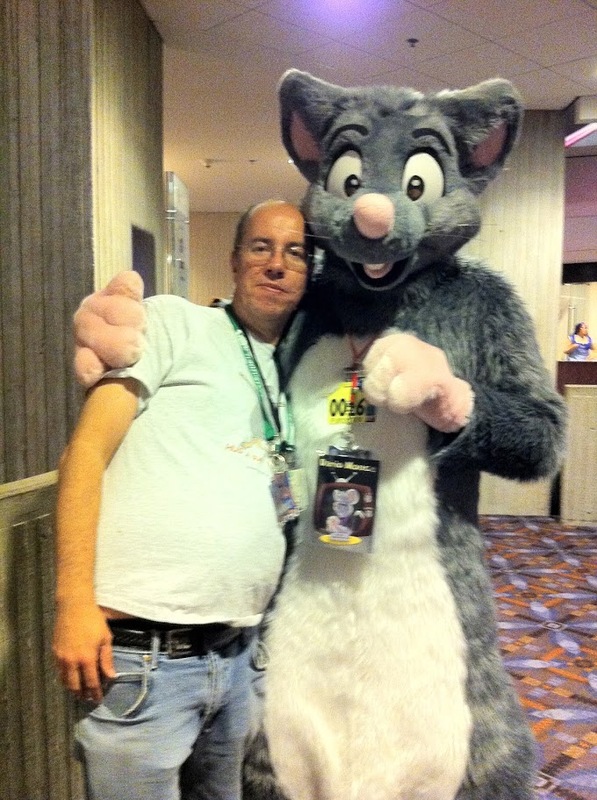 I got to collect a gift savant_da_rat left with a friend in the dealer's den. It was a big Roland Rat poster! I loved Roland as a child and he probably helped me become a rat. Sunday I was reduced to allotting time to furries, with of course con time trying to foul things up. I saw Toni (the Producer of A Tail of Identity) in Ziggy and we had a nice talk while she took portrait shots. Dyandod was staying in our room for a few hours because his closed down and he wanted to continue fursuiting. As thanks, he left us lots of leftover food. He's a nice rat, and I was pleased to have the opportunity to play on the inversion of a negative rat stereotype. After midnight I went out in Ziggy to check out the dead dog dance but it had wrapped up. I wandered about a bit and found JBadger and bought him up to our room to chat. Monday was a dismal experience, as the last day always is. Sad goodbyes and depressed furries. Toni came to the room to shoot me packing up and although Skov and Rukario were sceptical at first they soon warmed to her and opened up. It was all just chatting though; no video or note-taking, but she did take their contact details. Big brownie points to Skov for patiently helping me back Ziggy without the benefit of my space-saver bag. I then took the shuttle to the airport and with great heaviness of heart (though obviously looking forward to seeing Ristin again) I set off back to Australia. So the only scheduled event I attended was the (desultory) Pawpet show. A shame because I always love the furry talent shows. Although I had misgivings heading into the con, I had a great time once I was there and met many friends and had a lot of fun. I was scared I would be lonely there because it didn't seem to me that a lot of my friends were attending, but I managed to fill my time, with thoughtful help from Rizzo. I hope I will be able to go again this year, but that will depend on me finding a job. TL;DR version: Jagafeh is making a card game; it will be a lot of fun when it is finished. LJ is still my favourite blog. MFF was great fun. Wow, Dario's suit is nice! Glad you had a good con after all, and found some friends to hang out with. Also you mentioned Twitter, but didn't include your twitter name! Points off! It didn't really seem relevant to the post, but I've added links to my Twitter and FaceBook now for the curious. It was good to see you at the con as it has been a few years. Nice to have that chat with you. Just wish I was not so busy at times. I never did do an MFF report in the end. Im glad you managed to fill your time. Im sorry I was not around as often as I had hoped, but for me it was a pretty over whelming convention also. Oh, sounds like a lot of fun indeed! ^^ And that photo's quite cute; I really rather love Dario's suit. Rats had been engaged in a cuteness arms race with mice, but when I saw Dario's suit I surrendered. We can't beat that. Yeah, it's just too adorable — one of the most adorable suits I've ever seen, in fact. I wonder who made it, BTW, and when; the style rather reminds me of some of the very early fursuits. The suit was made by Surf Cat Costumes. The maker might be defunct though; the website doesn't work and the last suit on their FA page was 2 years ago. A pity, because I do like the very cute style. It was most awesome getting to meet you at MFF and hope to see you more at future events! Likewise! Thank you so much for that mouse! <3 It would be hard for me to do, but I hope I can repay that generosity some time. I don't think I ever hated Twitter, but it's very much a supplemental medium, for me - handy for minor or quick stuff, but poor for anything that doesn't fit into a few words, and consequently, ill-suited to affording a meaningful reflection of my friends' lives. Thus, as an addition to LJ, it works fine - not everything happening in one's life requires a new LJ entry, after all. Certainly not mine, else I'd update about annually. =:) Plus, whilst LJ's manglement can, shall we say, leave something to be desired, at the end of it, LJ's reason for being is simple - making weblogs happen, letting communities form around them, and ensuring it's all paid for quite simply and up-front, by subscriptions. I like that kind of honest funding. I initially saw Titter as an annoying fad that distracts from the serious business of real blogging. But then, I thought the same of blogging at first too! Ristin has been hooked by the Twitter bug too of course, but much to my surprise he seems to be using Google+ nowadays. Just look up Ristin. Serious blogging from the raccoon may be light on the ground, though. As for an uncensored transcription, I was considering putting the censored bits under a TMI filter but it doesn't really seem worthwhile. Do I vaguely recall you've been quite active in MiDiFur? I think you mean MiDFur: MIDI is a music format. ;) I have never done anything in particular for MiDFur, although I did provide a skit for the first MiDFur's no talent show. I unofficially worked as a gopher for Califur in 2009 (the committee will deny all knowledge of me if asked!) and did a panel on rodents for FC 2010. I have transported equipment for FurDU. I would like to do more gophering for FurDU in the future. Mostly I want to focus on having fun at cons because I can't attend many in a year.